I have shared some of the instant dosa varieties last week. Today i have come up with a easy to prepare colourful nutirent dosa to attract kids. The colour of the beetroot when added into the dosa batter gives a colourful and also an inviting dosa for sure. This is so easy to prepare if you have dosa batter inside you fridge. Adding the vegetable juice inside the dosa batter makes the dosa more inviting, nutritious and flavourful. 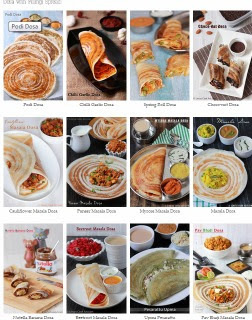 My kid loves crispy dosas in any form so trying many different dosas helpful to make his breakfast easier and healthier. You can name it as 'Pink Dosa' sure kids get attracted to this colourful dosa!!! In a blender jar add the chopped beetroot, green chillies and jeera. Grind well to make a fine paste with enough water. You could grind only beetroot and make the extract to the juice and prepare the same dosa. Strain the beetroot juice with out any bits and pieces inside a wide bowl. Now add dosa batter with the beetroot juice. Stir well and add salt if required. Heat a dosa tawa and grease with oil; take a ladle full of batter and spread as concentric cirles. Note: Dosa batter should be like Idli batter consistency before adding the beetroot juice. Colorful dosa, nice way to include beets.